Once a week, about 20 people on the front lines of ending chronic homelessness in Boston meet in an old conference room downtown. They call themselves the Chronic Working Group. They're employees of the city and state, homeless service providers, and the local public health commission and housing authority. They've been working for the last three years toward a goal of eliminating chronic homelessness in the city by the end of 2018. That ambitious goal was set in 2015, as part of Mayor Marty Walsh's action plan on homelessness. Under the plan, the city has implemented a new approach to try to keep people from being homeless for long periods of time. Despite the many strides they've made, members of the group acknowledge they're not going to meet the goal by the end of this year. But that isn't slowing them down. They know the hundreds of individual adults who've been homeless in Boston for a long time -- down to each person's medical conditions and housing history. And at their weekly meetings, they share the good news and the struggles. "This is somebody that we're having a real, real hard time trying to get him to move forward. But I think that we got him in a good moment that he was sober," says Leo Adorno from Pine Street Inn, referring to a client who's struggling with alcohol addiction and has previously refused housing but has now accepted a housing unit. That's the goal: to get people who've been homeless into permanent supportive housing. The services connected to the housing include help managing money, coordination of mental health treatment, and job training. The group works off of an official list of chronically homeless adults the city has generated twice a year since early 2016. Right now there are 471 people on it. To meet the government definition of chronically homeless, someone has to have been homeless for 12 consecutive months, or 12 months spread out over the previous three years. The person also has to have a disabling condition. One of those people is Brian DeSilva, who is 53 years old and has clinical depression and autism spectrum disorder. A Boston native, he's been staying at Pine Street Inn's Holy Family Shelter for almost two years. "Some days are better than others, and then some days I'm like, 'Why me? What did I do?' " DeSilva reflects. "And then I'm like, 'Wait a minute. Just walk through the fire a little longer. Things will get better.' "
Getting on the city's chronically homeless list six months ago was a big deal for him. It means new services started kicking in, like getting paired with a housing placement specialist at Pine Street Inn. The two meet every other week to fill out and follow up on apartment applications. The city also recently entered DeSilva in a software program that matches people who've been chronically homeless with newly available subsidized housing units. The program was launched in 2016. So DeSilva is benefiting from a level of coordination on homelessness that didn't exist in Boston until a few years ago. Before then, there was no official housing matching system. The homeless service providers and city officials weren't sharing information on clients or working together. Now they're communicating and even tracking what shelters people are staying in from night to night. One of the new programs that went citywide over the last few years is called front-door triage. 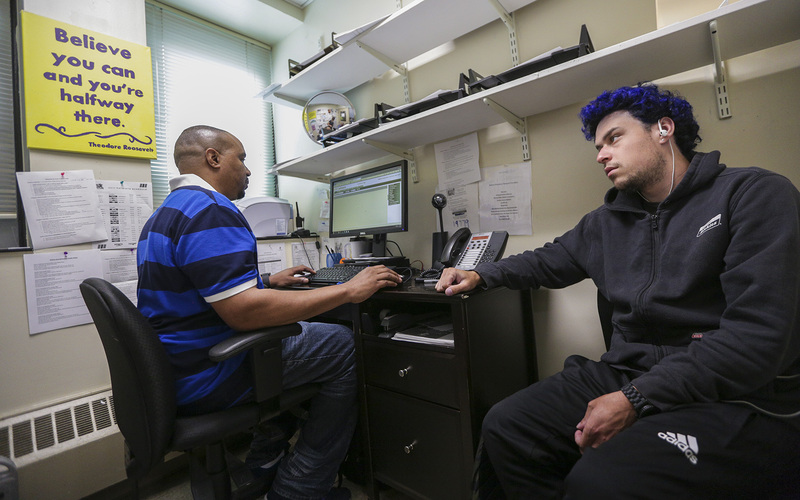 Its goal is to divert people from homelessness quickly — people like 25-year-old Jordan Gonzalez, who has come to Pine Street Inn looking for a bed. Gonzalez meets with triage worker Reggie Santos. "How'd you get homeless? Like, what brought you to homelessness?" Santos asks him. "I was just staying with my mom, and it just didn't work out. She ended up losing her place," Gonzalez responds. "So you don't have nobody that you can call up for assistance, to help you out as far as housing goes?" Santos asks. "Because this is not really normal for a kid of your age to be here." Gonzalez says he's exhausted all of his options staying with family members and doesn't have anywhere to go. Still, he gives Santos permission to call an uncle with whom he used to live. But in the quick phone conversation, the uncle says his nephew can't come back there to stay. Santos asks a wide range of questions about Gonzalez's education, health, income and housing history. And he tells Gonzalez about agencies to visit for help with job and housing searches. The triage program helps people get access to needed services for 30 or 60 days, depending on the shelter. But only about one-third of people who show up at Boston's shelters get to take part in the program because there isn't enough funding to cover everyone. For those who do get the opportunity, the triage program might provide a small amount of money to help them get through a rough patch, for example, or a bus ticket to get to a family member who's agreed to help. "In a very quick sense, in triage, we need to help them see that they deserve better. A shelter is not a home and community," says Dayna Gladstein, vice president of emergency services at Pine Street Inn. She says 18 percent of people who go through triage end up finding another place to stay right away. "If we can find them a pathway out of homelessness immediately ... their likelihood of ever becoming chronic goes way, way, way, way down." 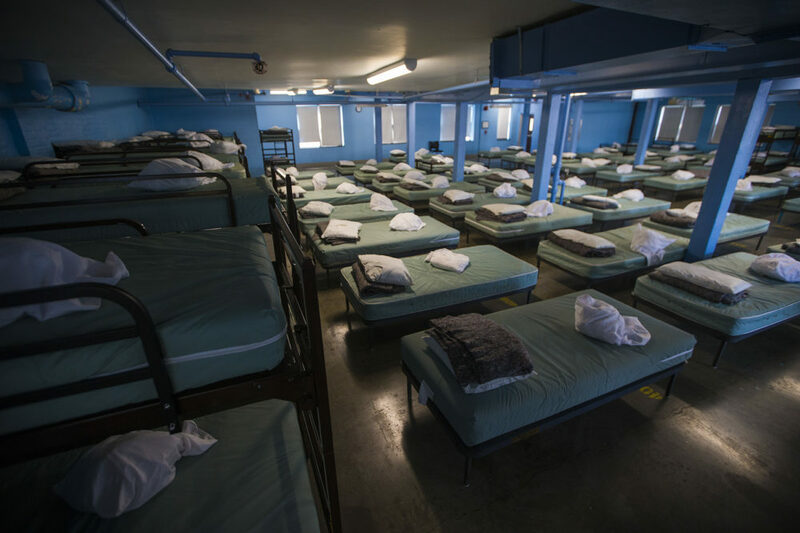 "If we can find them a pathway out of homelessness immediately, where they take zero shelter beds, their likelihood of ever becoming chronic goes way, way, way, way down," Gladstein explains. 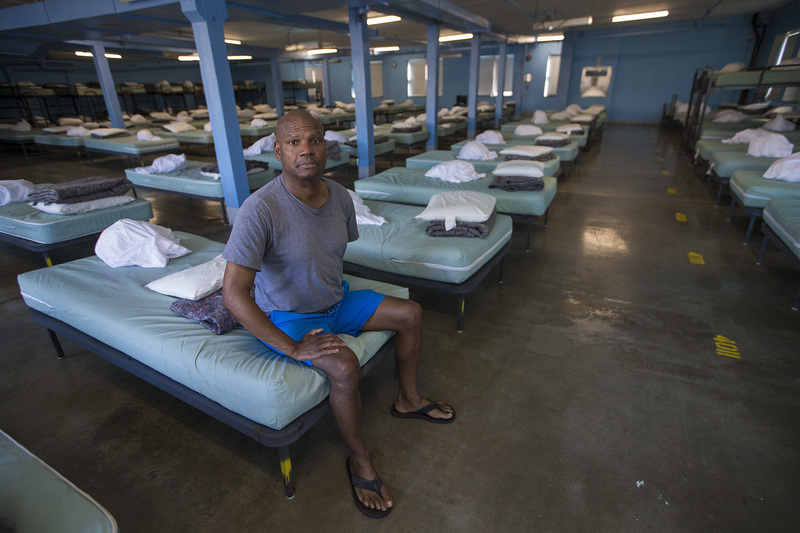 David Thomas, director of clinical services and permanent supportive housing for the homeless bureau of Boston Public Health Commission, says it's quite a change from the way things used to be, especially at the city-run shelters. 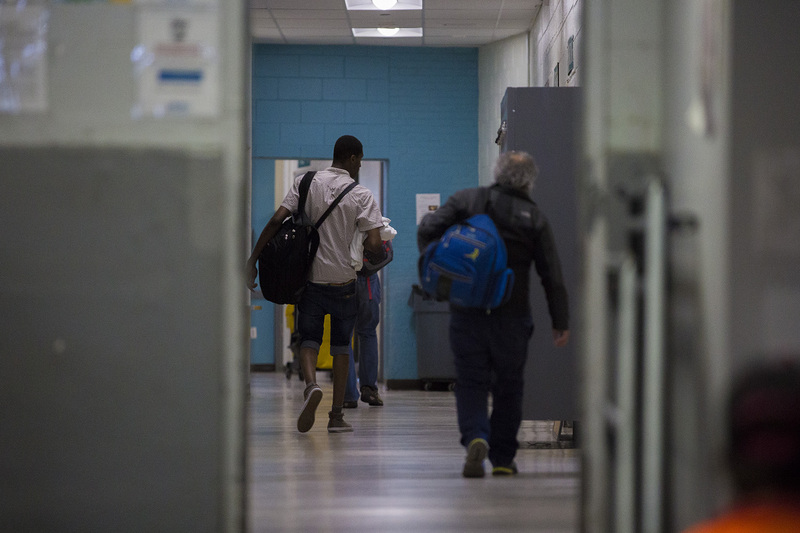 "People who were new to shelter might have been, at some times, the most reluctant to seek services, being in a very chaotic place with not knowing anyone, not knowing any of the staff," Thomas says. "So those people would sometimes get lost in the system for longer periods of time than anyone wants." He says the new initiatives, which include a computer program that tracks what shelters people are staying in each night, have reversed the problem of people bouncing from shelter to shelter without those running the shelters being aware that was happening. That reform isn't enough to stem the tide of chronic homelessness, however. "The number of people coming in has been overwhelming — into chronic homelessness," says Laila Bernstein, Boston's adviser to the mayor for the initiative to end chronic homelessness. Bernstein says until they started tracking it, city leaders did not anticipate the scale of the flood of people becoming chronically homeless — on average 455 people a year. "We didn't have a way to have a very precise understanding of how many people were coming in every month, whereas now we have a database that allows us to see that," Bernstein explains. "And we see more chaos, really, in the flow of the population than we could have known." City officials say at the start of 2016, there were 612 individual adults known to be chronically homeless living in shelters and on the streets. Since that time, the city and its homeless service providers have placed 601 people in permanent supportive housing. Only 23 have returned to chronic homelessness. But since then 1,049 others have become chronically homeless. One thing contributing to the crisis is the opioid epidemic. And it's not just that addiction is leading some people to lose their homes. 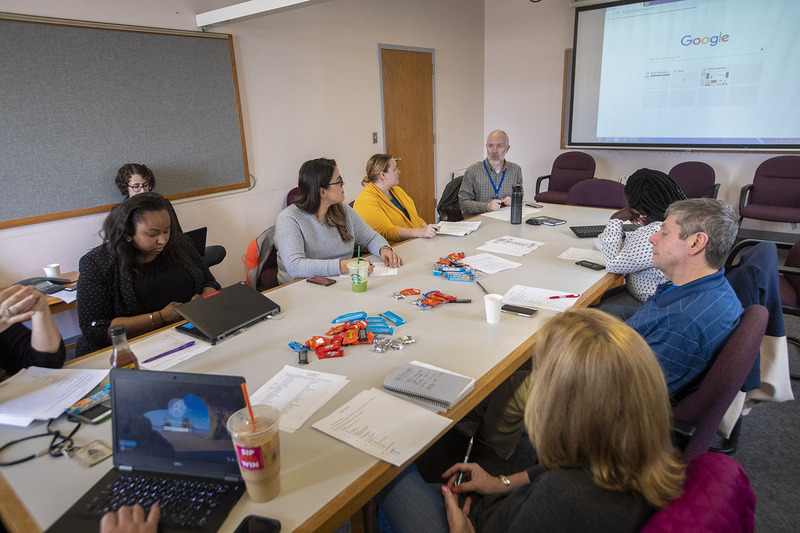 The services administrator at the Southampton Street shelter, Corey Grier, says there's a ripple effect when he and other staffers intervene in an overdose, which has happened countless times. "We're all running out in the street and trying to clear and make sure the scene is safe, and ... save their life, get emergency personnel on the scene and then afterwards address them by hooking them up with either addiction services or case management here to get into treatment," Grier says. "It would be ridiculous to think that that doesn't pull necessary resources away from the rest of the population." There's another factor that makes it tough for the city to get ahead of the curve on chronic homelessness: 50 percent of people who are homeless in Boston came from another town or state. Those people include 70-year-old Nancy, who came to Boston to get a shelter bed. She's petite, with curly gray hair and a fully made-up face, but tired eyes. 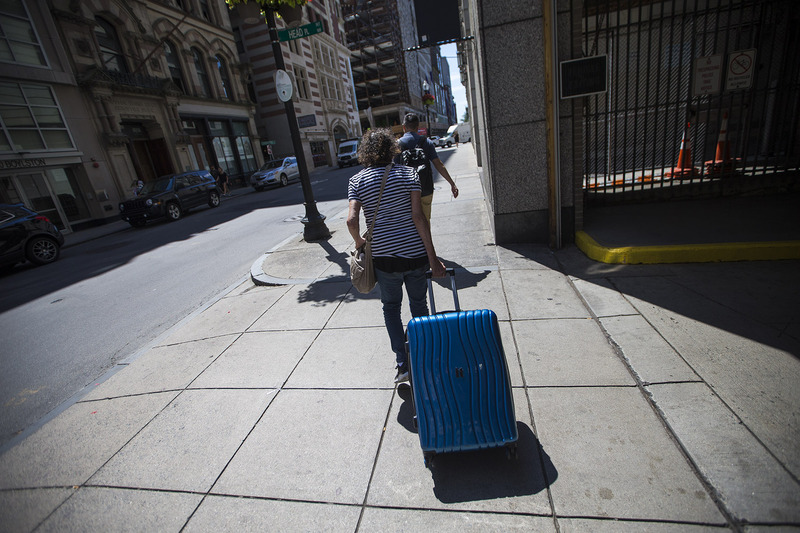 We met Nancy in July, wheeling her belongings in a large suitcase outside St. Francis House, the day shelter. "I got evicted like seven years ago from Franklin [public] housing because my cats were not tethered," Nancy says. She didn't want to use her last name, for fear of hurting her housing prospects. She says she had lived with a family member in Dedham for several years after her eviction. She became homeless last November. "The thing is, I really hate to move into Boston because I really hate all this congestion. I need peace," she says, adding that being homeless is taking a toll. "I used to have long hair before I became sheltered. I used to have fingernails, eyelashes," Nancy recalls. "Everything is just going, going. Stress, I'm assuming it's stress." City leaders say they've talked with some neighboring communities about partnering more on homelessness, but that it's hard for any community to make much progress without more federal investment in affordable housing. The shortage of housing units is one of the greatest challenges in helping people who are chronically homeless, according to Lyndia Downie, Pine Street Inn's president and executive director. "The vacancy rate is low and the rents are high," Downie says. "So it's really, unfortunately, a perfect storm for people experiencing homelessness in terms of trying to get out of shelter." Kimberly Wilson, the housing placement specialist working with DeSilva, says just trying to find apartments for which someone is qualified can be frustrating. "I'm reading the small print and I'm sitting there going, 'Oh my gosh, these people gotta make, like, the salary of four people to live in this particular building,' " Wilson says. "And [the properties] do advertise on every website we were looking for as affordable, affordable. And I'm going, 'But whose affordable?' "
Advocates say even people who've obtained rental assistance vouchers, such as Section 8, have a hard time finding units that are affordable with the vouchers, or landlords who want to take them. To try to make a dent in the problem, the city has implemented a new program to attract landlords to rent to people who are coming out of homelessness. "I think to end homelessness you need ambitious goals. And this goal has driven us to make extreme changes in the way that we're responding to homelessness..."
Ian Gendreau, from Boston's Department of Neighborhood Development, says the group working to tackle chronic homelessness is up against another dynamic: people who aren't ready to accept housing. Gendreau manages the computerized system that matches people with available housing units. He says sometimes when a match comes up, the building or neighborhood isn't the right fit based on the person's history or disability. Or, sometimes there are larger forces at work. "For a lot of people, especially if you've been in shelter for a long period of time, your social network is there and your support network is there. And to be pulled away from that is a scary prospect," Gendreau says. "And you could layer things on top of that — mental health problems or substance abuse problems or things like that — but ... the top of our list is just chock full of people ... who aren't interested in housing." DeSilva is more than interested. He's actively seeking apartments on his own, as well as with assistance from Pine Street Inn and the city. His housing options are limited, but they just expanded somewhat because he got approved for Social Security Disability Insurance and Supplemental Security Income after a few tries. His income will go from about $100 a month — which he gets from the state because of his disability — to almost $2,000. He has an extensive work history but says it became too difficult to hold down a job. Unlike most people, DeSilva became homeless somewhat by choice. He had been living with his mother, and she had the opportunity to get an apartment in a safer neighborhood. But it was one bedroom, not two. He told her to take it. Asked about where he sees his life going when he gets an apartment, DeSilva says he wants to take a course in web design or something else that pays a "living wage" but doesn't involve a lot of social contact. "I can work on my own and be self-sufficient," he says. It's a big vision for the future from someone who's thankful for all the help he has in getting there. "I'm not too proud to ask for help and to receive help," DeSilva reflects. "But I just want to do it temporary, until, you know, I can be on my own two feet." As for city leaders tasked with the once-unthinkable goal of ending chronic homelessness? The mayor's adviser on the initiative, Bernstein, says they still have a big vision, too, even though they won't reach the goal this year. She says she has no regrets about the city having set such an aggressive timeline. "I think to end homelessness you need ambitious goals," Bernstein says. "And this goal has driven us to make extreme changes in the way that we're responding to homelessness, and we're serving people better because of it." They will keep pushing for new funding — from the state and federal government, and even private donors — to create affordable housing and permanent supportive housing. 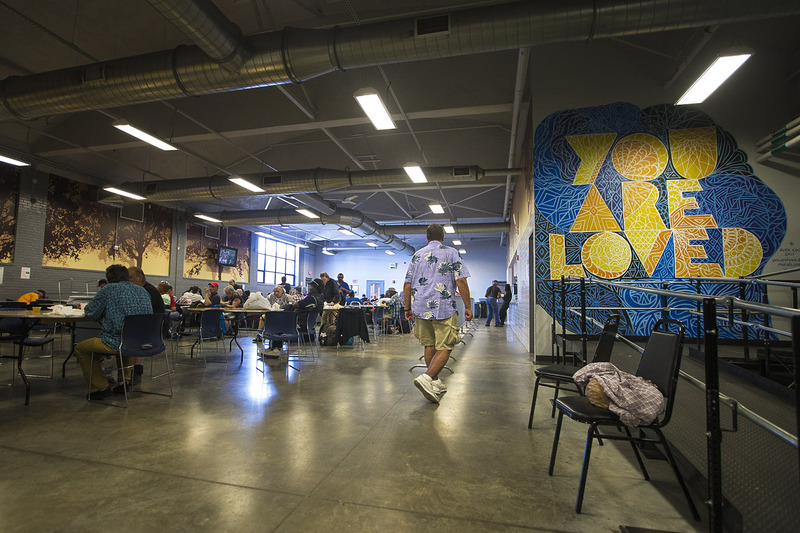 And they have a goal of eventually being able to "triage" everyone who comes to a shelter, with the hope of getting ahead of the tide on homelessness. This segment aired on October 9, 2018. Lynn Jolicoeur is the field producer for WBUR's All Things Considered. 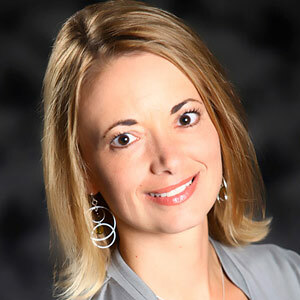 She also reports for the station's various local news broadcasts.